Learning Japanese is tough. It’s a beautiful, but completely foreign for an American. 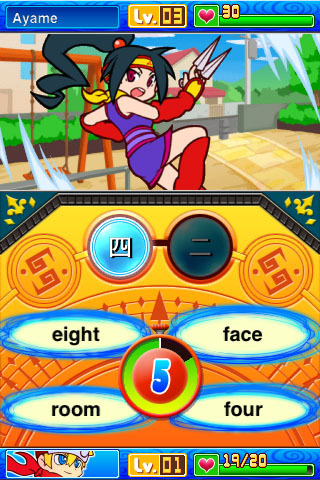 The kanji, the pronunciation, the grammar structure, it’s all so very different from English… So Sazanami has presented us with an innovative, interesting, and intensely challenging game app to give us a fighting chance of learning Japanese. Ninja Words is available on the iPhone, iPod touch, and iPad for $2.99 and has a Lite alternative. The art is absolutely wonderful. I’m seriously impressed by the cute anime style that is bright, colorful, bubbly, and is very professional in terms of quality. Great job! The interface, the map screen, and battle scenes are all extremely well done. I particularly enjoy seeing the cutscenes for the style and design of each scene. While you do these battles, you will actually start recognizing symbols. Before Ninja Words, I’ve already known the 1, 2, and 3 of the Japanese language… mostly because it’s just 1 line, 2 lines, and 3 lines… but thanks to this game, I now know what the 4, 5, 6, and 7 characters are! Unfortunately, all the other battles involve complex words and symbols that basically reduce the game to a guessing game. There is an inventory area in the menu list under Spell Ball and its many ranks of difficulty. STUDY THESE. Seriously, it’s actually pretty ingenious to place these basic lessons in a game form. In 2 minutes, I learned most of Rank 1, which is the numbers set. I’ve since learned words like “Fire”, “Meat”, “Summer”, and “Black” amongst several others. The leveling and damage system work well to motivate me to constantly replay an opponent just to learn the kanji sets they use. As a game for the extreme casual crowd, this is a confusing, difficult, unfair game with a ridiculous learning curve, and high expectations. For anyone who is actually interested in learning how to read basic Japanese, those of you who are students taking Japanese class, those who want to put some thought into your games, and those who already know Japanese and English, this is a spectacularly unique game and despite the very sudden and difficult learning curve, the satisfaction of answering correctly is a joy that I can’t possibly explain. I love the fact that I can run 100% through the first 3 opponents and memorized most of the symbols though gameplay alone. Nice. 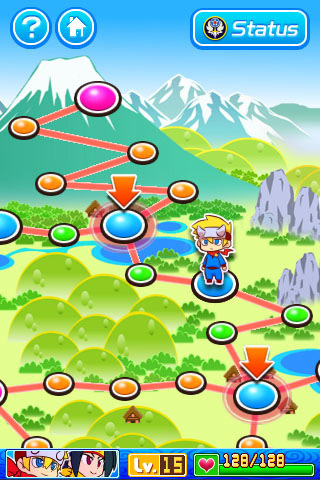 AppSafari review of Ninja Words was written by Joseph Ho on October 22nd, 2010 and categorized under App Store, Education, Featured, Games, RPG, Strategy, Time Management. Page viewed 3905 times, 1 so far today. Need help on using these apps? Please read the Help Page.